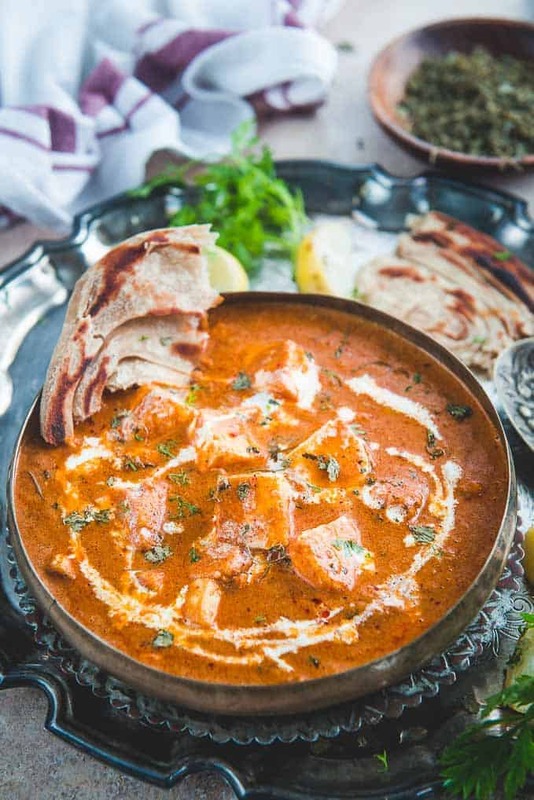 Paneer Butter Masala is essentially one of the simplest yet satiating Indian accompaniment made using dollops of fresh cream, paneer and spices. This paneer recipe can be easily made at home and the result is quite rewarding. Out of all the paneer recipes, this paneer sabji is our favourite and the best part is that it is super easy to make as well. Here is how to make Paneer Butter Masala Recipe or Butter Paneer at home (Step by Step + Video). Be it summer, winter or monsoon, run out of ideas for sabzi of the day but if you have a slab of paneer at home then you know that your worries would not last long at all. On countless occasions, I have ended up relying upon one this ingredient – paneer and it has never ever failed me. Right from those warm home parties till instant meals for the family, whenever I feel like serving them something simple, Indian yet delicious my mind thinks about paneer recipes without a doubt. Having recently tried Khada Masala Paneer last week, my kiddo has suddenly started loving paneer to an another level these days and his sweet requests, kind of have convinced me to try out recipes like Lahsooni Methi Paneer, Shahi Paneer and even Hotel Style Paneer Butter Masala as often as I can in a month. This Butter Paneer Masala is just like your fav restaurants version and it tasted fabulous with the creamy texture and super flavorful curry. Paneer is a fav ingredient in Indian Vegetarian Cooking and many recipes can be made using Paneer as the star ingredients. I have a good collection of Paneer Recipes on the blog which are loved by the readers. Sharing some of the Paneer Recipes from the blog here. Paneer Butter Masala or Butter Paneer is a very popular curry where Indian Cottage Cheese or Paneer cubes are simmered in a mildly rich and sweet tomato cashew nut based gravy. This curry goes very well with Indian breads and is a popular dish on restaurants menu. Butter paneer has this fresh flavour of butter, onion, cashew nuts, tomatoes and a dash of garlic, ginger and green chilli. I love the way the gravy blends and nicely fuses with the tender pieces of paneer while you are sautéing the sabzi and the result turns out to be incredibly lip-smacking. Finally, when it is served, just dunk the fresh chunk of your choice of flatbread in this luscious, slightly sweet yet pungent paneer loaded sabzi and you know that you are having an awesome meal! Serve it for lunch or dinner with any Indian bread of your choice. Use canned tomato puree to maker Paneer Butter Masala. The taste of the canned puree is much intense which cannot be replicated by home made puree. Grind the masala to a fine paste. The gravy should be silky smooth. Add the cream and honey at the end of cooking. If you plan to freeze the gravy, skip adding honey and cream and add them at last when you are ready to serve. You can freeze this gravy in freezer safe container for 2-3 months. Just thaw over counter top for 3-4 hours and then heat again in a pan and add honey and cream before serving. You can also give a smoky flavour to this curry by keeping a piece of red hot charcoal on a aluminium foil and sprinkling some ghee on it. Close the lid immediately for the curry to soak the flavour of the smoke. Use fresh soft paneer to make this recipe. Since the paneer cubes are not fried, they must be very fresh. If the paneer is old, boil it for 2-3 minutes in water. Discard the water and then use the paneer. You will need butter and a little oil to start the recipe. Oil is added so that the butter doesn’t burn while cooking. Adding whole spices like cloves, cardamom etc add a very nice flavour to the dish. I have used very little onion, you can choose to skip it. Other than that, tomatoes, ginger, garlic and green chillies goes into making the gravy. Make sure to choose the ripest of tomatoes because it’s them that gives the taste and colour to the final dish. Grind the onion, tomato masala to a very fine paste. While grinding, do not add too much water otherwise the paste will not become fine. Spice powders like coriander powder, turmeric powder, red chilli powder, garam masala powder etc will be needed. Store bought tomato puree and tomato ketchup is a must to make this recipe. Since they are much concentrated than the homemade ones, they give a very characteristic restaurant like taste to the dish. Finally, do not forget to add honey and lemon juice to balance the flavours and no Paneer Butter Masala is complete with Kasuri Methi. Which Cream to use for making Butter Paneer Masala? I have used Amul cream to make paneer butter masala. You can use any low fat cream that is available in your part of the world for this recipe. You can also use homemade Cream or Malai collected over milk in place of fresh Cream. How to make Vegan Paneer Butter Masala? 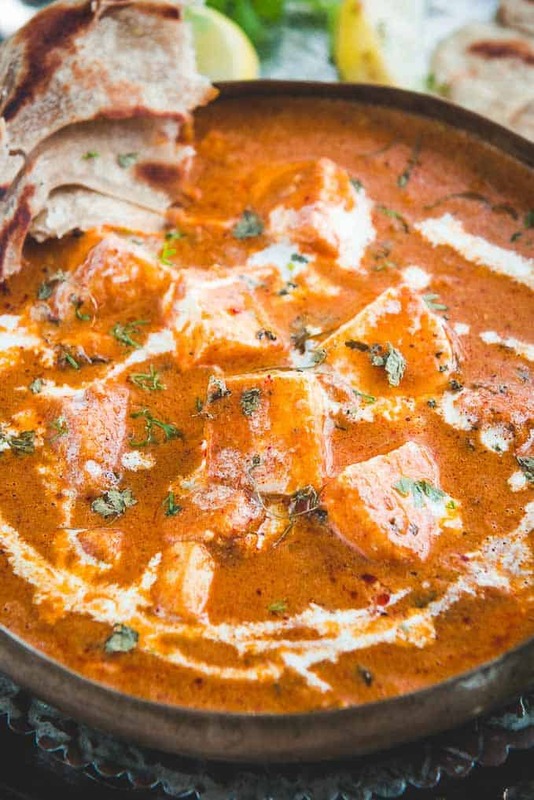 To make Vegan paneer butter masala, you can swap paneer with tofu. Butter with any vegan butter of your choice and cream with cashew cream. the taste still remains fabulous, so not shy away from trying out a vegan version of this butter paneer curry. 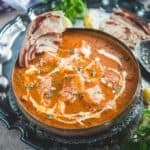 How to make Jain Version (No Onion No Garlic) Paneer Butter Masala? To make a Jain version of this recipe, just skip adding onion, ginger and garlic. All the other ingredients are allowed in Jainism and since we have added very little of onion and garlic in the recipe, it will not affect the taste much. Heat 1 tbsp butter and 1 tbsp oil in a pan. Once the butter is hot, add cloves, black cardamom and green cardamom. Fry for a few seconds. Add onion and saute for 2-3 minutes. Add chopped tomato, ginger, garlic and green chilli and cook for 2-3 minutes. Now add cashew nuts and cook for another minute. Remove the pan from heat and let the mixture cool. Grind the onion tomato mixture in a grinder to make a smooth paste. Heat the remaining 3 tbsp butter in the same pan. Add the ground masala in the pan. Add coriander powder, turmeric powder, Kashmiri red chilli powder, tomato puree and salt. Now add paneer cubes and cook for 3-4 minutes. Add more water if required. Add garam masala powder, fresh cream, honey and kasuri methi. Cook for another minute. Paneer Butter Masala is essentially one of the simplest yet satiating Indian accompaniment made using dollops of fresh cream, paneer and spices. This paneer recipe can be easily made at home and the result is quite rewarding. Once the butter is hot, add cloves, black cardamom and green cardamom. Fry for a few seconds. Now add cashew nuts and cook for another minute. Remove the pan from heat and let the mixture cool. Add the ground masala in the pan. Add coriander powder, turmeric powder, Kashmiri red chilli powder, tomato puree, tomato ketchup and salt. Now add 1/2 cup of water and cook for 2-3 minutes until oil starts to separate on the sides. Add paneer cubes and cook for 3-4 minutes. Now add garam masala powder, fresh cream, honey and kasuri methi. Serve hot with Naan or Laccha Paratha. Looks great! Paneer butter masala is always loved. Especially by kids. My daughter is just the same. She can have paneer everyday without getting bored and I am forever doing experiments on that poor slab of cottage cheese 😛 The pictures are so lovely!! Great work. Thnx :). I think most kids love Paneer. Mine is no different. Ooo I love paneer masala (or.. paneer anything!). I’ve never tried making paneer at home, and have a hard time finding it pre-made here. I’ll have to try soon though! You can try it in Indian stores near you. They always stock it. Wow! This looks absolutely amazing! I think my curries up to this point are probably more pedestrian than what you’ve put together here — in fact, I’ve never heard of a few of the ingredients.. And paneer… never tried it. What is it made from? The look reminds me of tofu, but something tells me I’m off base there. That sauce looks absolutely vibrant – and with all the spices – I’ll bet it positively jumps on your tongue! Paneer is Cottage Cheese Lisa. It’s a little dense than what you get in the US. Any Indian grocery store will have it. I even found it in a few Costco too.Do try it once. You will love it. So…I may have watched the video twice. Because it just looks so good and now I’m really hungry. I’ve never seen paneer in my grocery stores but then again, I haven’t looked for it specifically. I hope I can find it because I need to make this! Do try this recipe. I am sure you will love it. I’ve never had this dish and it looks like something I’d love to try! The colors are so vibrant and the texture looks so creamy! All of those aromatic spices must smell amazing when this is cooking. I especially love cardamom, so I must make this soon! Do try it Amanda. It’s one of our favourites. Tried this recipe…. it came out well…. thank u so much….